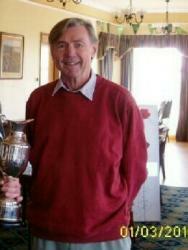 A Mass of remembrance for the late Terry Swinson will be held at 12 o clock on November 3rd in Aughleam church. Tea and coffee will be served afterwards in the Heritage Centre down the road for anyone that would like to reminisce. Unfortunately the Wild Atlantic Way AmAm is on the same day but it would be great to see a few of the Club members and neighbours of Terry attend. A number of us travelled to Northern Ireland yesterday (Sept 24th) to attend the funeral service of our former Honorary Secretary Terry Swinson, who served in that capacity with great aplomb from 2001 to 2009. 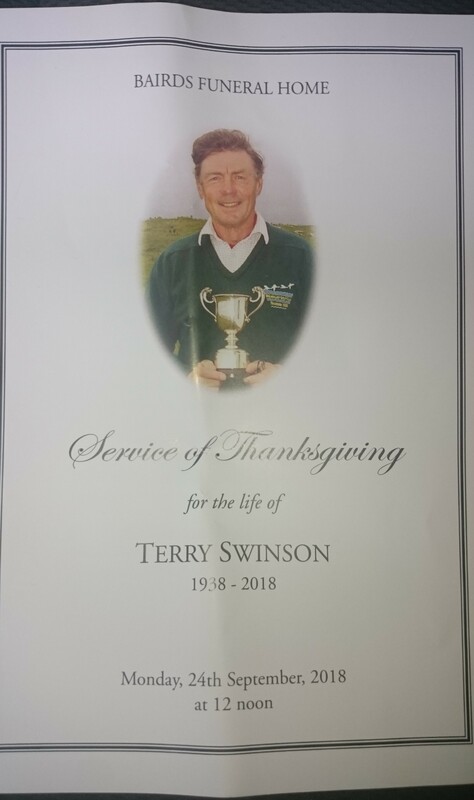 It was an honour for us to be asked by Nicola and Terry's family to carry his coffin when it arrived at Portstewart Cemetery and the choosing of the photo below for his Thanksgiving Service gives you an idea of how much Erris and Belmullet Golf Club meant to himself, Nicola and his family. He is pictured with the Land Commission Cup (donated by John Boyd a number of years ago) which he won for Best Senior in the Captain's Prize a number of years ago. May He Rest in Peace. It is with very heavy hearts that we inform you of the death of our former Honorary Secretary Terry Swinson. Terry passed away earlier today in Northern Ireland. He was an absolute gentleman and a super efficient officer of the Club. Our thoughts are with Nicola and his family at this time. Belmullet Golf Club owes him a great debt of gratitude. 20th September 2018, peacefully at hospital. Much loved husband of Nicola, Greenvale Road, Antrim, loving father of Brian, Karen and the late Peter, much loved grandfather of Emma, Kate, Connor, Ed, Jamie and Tom. A service of thanksgiving for Terry’s life will be held in Bairds Funeral Home on Monday 24th September 2018 at 12 noon followed by interment in Portstewart Cemetery arriving at approximately 3.00 p.m.
Family and friends are welcome to call at the family home. Family flowers only please. Donations in lieu if desired, sent directly to either Dementia N.I, 54 Elmwood Avenue, Belfast, BT9 6AZ, or Antrim Day Centre, 32F Station Road, Antrim, BT41 4AB. Lovingly remembered by the entire family and his circle of friends.